Endnotes and references are available in the full PDF version of this report. But the vagueness of its policy proposals is hardly a basis for dismissing the movement’s significance. It gave voice to, and made more broadly known, some basic facts about labor markets. While growing income inequality—and in particular the sharp and growing division between the 1 percent and the 99 percent—is something that has been documented by labor economists for more than a decade, it is now headline news and the subject of serious policy discussion in a way that it was not before the movement began on September 17, 2011. In important ways, the social conversation has begun to move toward a clearer understanding of the underlying causes of inequality, why it is something we should care about, and what concretely can be done about it. There have been many healthy contributions to this debate. Among the most thorough and detailed is the report, “Divided We Stand: Why Inequality Keeps Rising,” published by the Paris-based think tank, the Organisation for Economic Co-operation and Development. The report offers a careful and solid reading of the facts; reviews and evaluates the underlying explanations that have been offered; and highlights not only why inequality should be a concern but also the trade-offs involved in implementing—and not implementing—policies to address it. This paper focuses on one claim that has particular resonance in the United States: the suggestion that inequality erodes opportunity. Indeed, there is a growing body of research that examines whether inequality harms growth, discussed and reviewed in part by Columbia economist Joseph Stiglitz and University of Chicago economist Raghuram Rajan. If one of the consequences of higher inequality is less economic mobility, then this may have real consequences for economic growth, as many talented individuals will be excluded from reaching their potential. In order to understand whether the economy as a whole can be affected by economic mobility, however, we need to first describe the relationship between inequality and mobility and the likely causes of this relationship. What do the underlying statistics mean, and, in particular, is something with the rather cumbersome name “generational earnings elasticity” appropriate for understanding equality of opportunity? These are important questions because they help us to appreciate the implications of economic inequality and mobility for public policy: How should we think about sliding down the Great Gatsby Curve? Is that desirable? How is it possible? 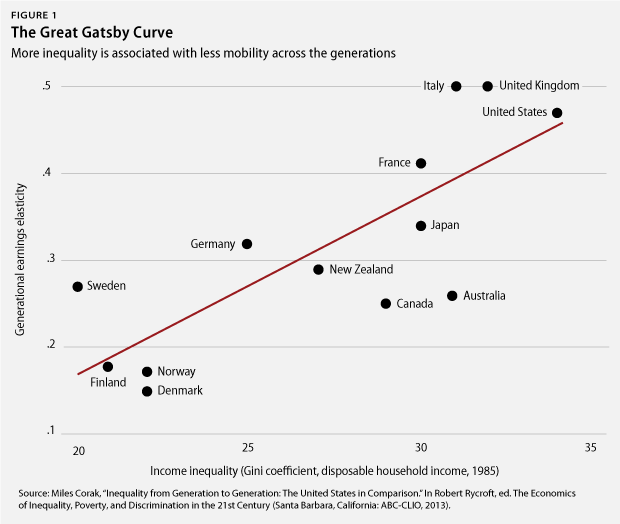 Others can discern how sliding down the Great Gatsby curve may affect the greater economy, but if the reasons include lack of access to opportunity, then the effects on growth could be important. 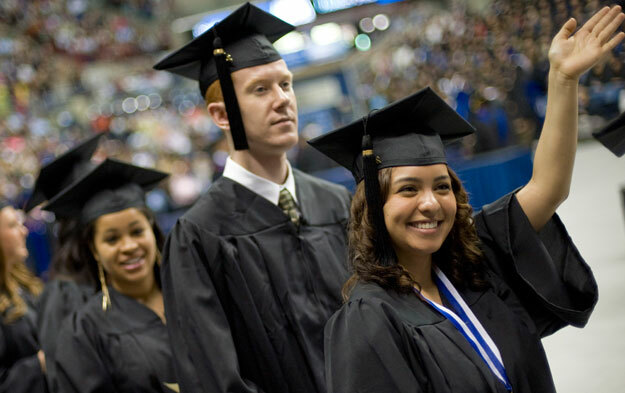 The American Dream is a phrase that captures many citizens’ aspirations for a good and successful life. It has many meanings and associations but at its core is the idea that Americans have the freedom to do and become all that they wish with hard work, energy, and talent—regardless of whether they were born rich or poor. No one statistic can capture these aspirations, but the strength of the tie between a child’s adult earnings and the earnings of his or her parents is an important signal. It measures the degree to which inequalities are passed down across the generations and as such is appropriately paired with the level of inequality in a country at any point in time. This pairing, as depicted in the Great Gatsby Curve, suggests that the United States is not only among the most unequal societies in the rich world but also among the least mobile. But comparison is not causation. The cross-country comparisons offered by the Great Gatsby Curve invite us to explore the underlying institutional and policy differences between the countries to better appreciate the causes and to raise the possibility of making changes. The Great Gatsby Curve is the outcome of a whole series of gradients between socioeconomic circumstances and the outcomes of children as they make the transition from infancy to school readiness and ultimately from school to the job market. The life chances of children are, at the broadest level, determined by the care, nurturing, and direction they receive from their families, the structure and nature of inequalities in the labor market with which they must engage, and the degree to which public policy can level the playing field with human capital investments that are relatively more advantageous to the relatively disadvantaged. The stronger and more enriching the family environment, the more equal the life chances of children. The more equal the labor market, the more equal the life chances of children. And the more progressive public policies in place, the more equal the life chances of children. In America all three of these forces are aligned in a way that reinforces rather than weakens the tie between socioeconomic status and adult outcomes. American families are more diverse in their capacity to invest in and promote the human capital of their children. Labor markets are more unequal, skewing resources and incentives in a way that benefits the relatively rich. And in spite of these greater challenges, public policy does less to level the playing field. Indeed, in some important ways, policies do just the opposite, tilting the playing field to help the more advantaged. This implies that in an era of growing labor market inequality, it is unlikely that the United States will slide down the Great Gatsby Curve in the coming years unless Americans enact effective changes and realignments in public policy that more strongly promote the human capital of the least advantaged. This paper explores the dimensions of that slide. Miles Corak is a professor of economics with the Graduate School of Public and International Affairs at the University of Ottawa in Canada.